I feel silly posting something about Mother's Day three weeks after the fact, but it's easily customizable for Father's Day (surpriiiiiiise, Jesse!). The one I made for my mother is similar to one I made for my mom in high school. Except that one said "Good morning, Mom" and not "Good morning, Grandma." If I had given my mom a mug that said "Good morning, Grandma" when I was in 10th grade I'm not sure this story would have a happy ending. Filled up with chocolates and presented to all of the other moms in Will's life, they made a useful & personalized gift. 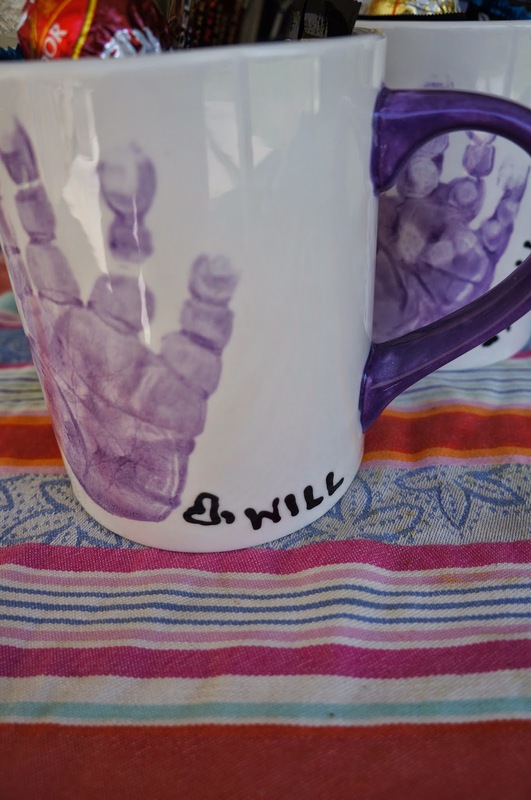 All you need is your baby's hand, a paint your own pottery studio, and a few days for them to fire it. Look at those chubby little hands. I think I need to head back and make one for myself! What did you have for Memorial Day? I had this. Tuscan style rib eye steaks that seriously rivaled the steaks we had in...Tuscany. While Charlie was golfing, I went to Whole Foods by myself (read: I went alone and had zero voice of reason with me). I was supposed to just go and only get my special green juice but I swung by the meat counter and saw dry aged rib eye. HELLO, I said. OMG. So tender. So amazing. Charlie was a little freaked out about the rub I made. Did you already put the rosemary on the steaks? Oh you did. I'm sure it'll be great. It was...it really was. Anyway, the rub is super easy. I mixed olive oil, fresh garlic, fresh rosemary, red pepper flakes, lots of sea salt and pepper. YUMMM. I tried a teaspoon of this as is and then was confused why I had severe heartburn all evening. Silly me. Here are the steaks...dry age, boneless, rib eyes. Voice of reason. Gone. I took the marinade/rub and rubbed it all over the steaks and then let them mellow on the counter top for about 2 hours. It's important that steaks reach room temp before cooking, so they sear and grill nice and evenly. ...and then slapped these babies on. He cooked them for two minutes, and then turned them 90 degrees to get the beautiful grill marks you see below. He then flipped them and did the same thing on the other side. So, for medium rare steaks, they cooked for a total of about 8 minutes, 4 minutes on each side. Hotsy totsy. Oh my. We let them rest for ten minutes before slicing and serving. I seriously sat at the counter and just stared at them for ten minutes while Charlie stared at me to make sure I didn't touch them. Wise man. This steak. OMG. This steak. So the rosemary and the garlic and the salt and the other amazing ingredients and the crazy hot heat form this AMAZING crust and leave it perfectly tender in the inside. I just can't. Drooling. I'm like drowning in drool. Set the steaks aside. Mix all of the rub ingredients together in a food processor. Rub all over the steaks and set aside for 2 hours. Heat grill up to 500 degrees. Place steaks on grill with metal tongs. Let cook for 2 minutes and then turn 90 degrees and cook for another 2 minutes. Flip steaks and repeat - 2 minutes, turn 90 degrees, cook 2 more minutes. This is for medium rare - if you want medium I'd add another minute per side. Let rest for 10 minutes. This is important! Make sure to let it rest. Slice and serve. 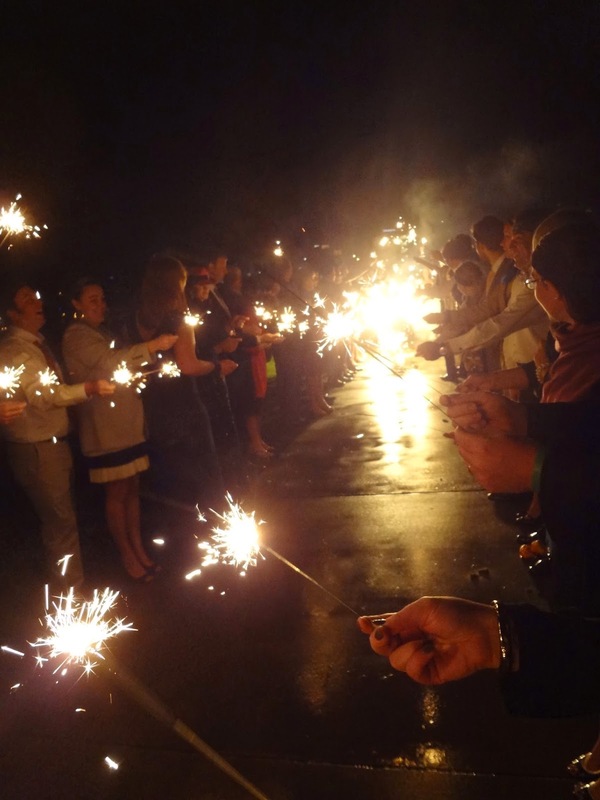 So I wasn't joking about blogging nonstop about my friend Ams' wedding. 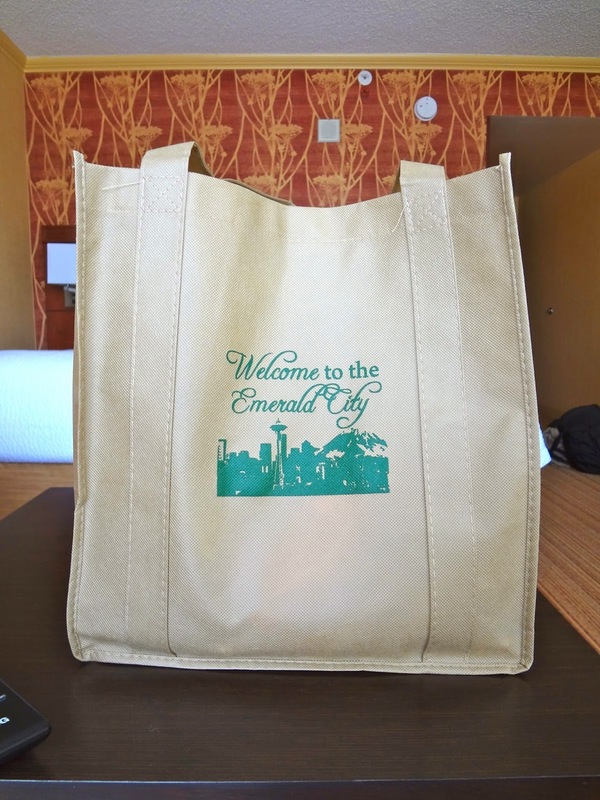 It's not shocking that after amazing hotel gift bags, I knew to expect something special for the big day. The wedding itself was at the Museum of History and Industry (the "MOHAI") on South Lake Union in Seattle. The venue was AMAZING and I'm hoping that her photographer will let me use some of their professional photos because my point and shoot camera pictures do NOT do it justice. I didn't trust myself to bring my nice camera, given that there was cross country travel & nonstop cocktails involved. I was at Table 8, New York City. 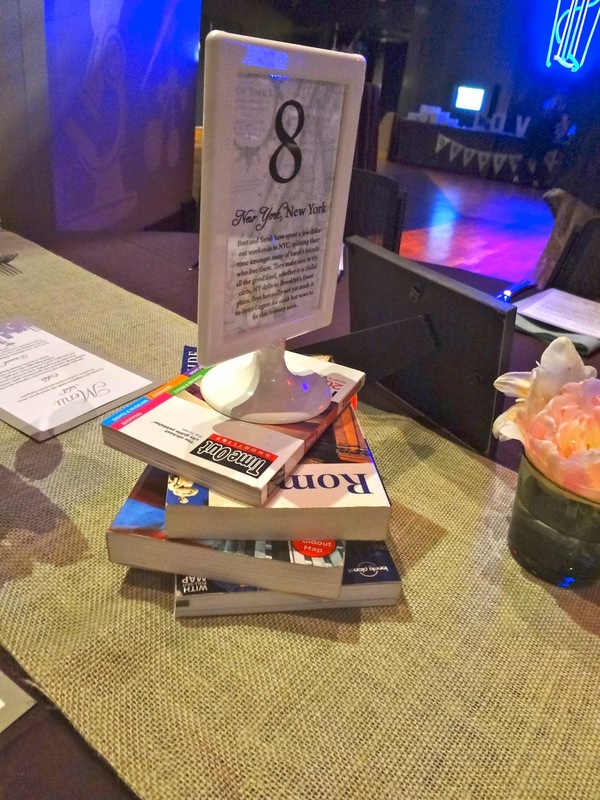 The other tables were all of the other locations they'd visited together and underneath each table number was a stack of travel books. At each table setting was a note from the happy couple, explaining that the guests were to take home a guide book from the centerpieces to help inspire our "next big adventure". How cute is that? An amazing end to an awesome evening. I'm obsessed with the travel theme of this wedding and hope to be sharing some photos soon that actually do justice to this incredible night. 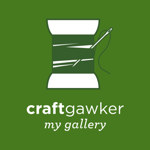 Thanks again to Bret & Ams for giving me weeks worth of blog fodder! Hope married life is treating you well. I remember the first time my mom made these. And ever time since. They are so freaking delicious I can't even deal. AND IT IS SO EASY. Like scary easy. I remember making these when I was home alone one time. I made myself a sandwich and I made one for my dog JoJo. She was pretty pumped about it. This was the first time I added cheese though, and I think this will be the new staple. So I know it sounds weird. Roast beef. In butter. But something happens to the roast beef when you saute it in the melted butter. The entire flavor changes and it becomes glorious. I would recommend buying rare roast beef from the deli counter. That way, when you saute it in the butter it doesn't become super tough. You are basically cooking it...twice...so you want to be careful not to over do it. Saute the beef for about 2-3 minutes. Just long enough for the butter to work into the beef. This is what it'll look like. Drooling. I'm drooling. ...and toasted them in the oven for about 2-3 minutes at 325 degrees. Just enough to heat the rolls through and melt the cheese. Holy cow. Literally. Somewhere in Connecticut, Caitlin is scrunching her nose up at that joke. Here's the "recipe." It's more about assembly, not the recipe. Melt the butter over medium heat. Add the roast beef and saute the beef gently for 2-3 minutes or until the beef cooks down and the butter fully coats it. While beef is cooking, toast kaiser rolls with provolone for 2-3 minutes in a 325 degree oven or until the cheese is melted and the rolls are heated through. Pile the rolls high with beef and serve immediately. This weekend we went out to dinner with some dear friends to a new(ish) restaurant in Chicago called the Tortoise Club. Per usual, I scoped out the menu a few days before and they had something yummy listed - homemade french onion dip with sea salt and vinegar chips. I couldn't wait to try it. When we went to order it, however, they were out! W...T...F. Anyway, it was stuck in my head so I thought I would whip it up myself and it came out great! Score. Start by melting butter and a little olive oil in a pan. Next, add your shallots, garlic, and vidalia onions. I love all of these ingredients...I mean, how can this dip not be good. Break up the onions so they cook nice and evenly...like this. Add some salt and pep. The trick is to cook the onions low and slow...you have to be patient here. I cooked them over low/medium heat for about 30 minutes, stirring every few mins. If the onions start to stick (which they will) add a little water to loosen them up, about two tablespoons at a time. This will help deglaze the pan a bit too. Remove the onions from the pan and let cool. While cooling, mix together the mayonnaise, sour cream, garlic powder, Worcestershire and balsamic vinegar. If you only have Worcestershire, use that. I like the tang of the vinegar, but don't go out of your way. It's subtle. This is optional, but I like green onions so I added some to the dip to freshen it up a bit and add some color. Once the onions have cooled off, give them a rough chop and then add them to the rest of the ingredients. Taste it and season appropriately with pepper and a little salt, if needed. Cover and set aside in the fridge for 2-3 hours, or until it's nice and chilled and set up. This is important because it takes a bit for the flavors to meld. YUMMMYYYY. This was so delicious! Never, ever ever ever, buy premade onion dip again. This is soooo much better. Melt butter and olive oil over medium heat. Add onions, garlic, and shallot. Work the onions to loosen up the rings. Lower heat to low/medium and saute for 20-30 minutes or until onions are a deep golden brown. If onions stick, add a little water to deglaze. Set onions aside to cool. In a mixing bowl, add sour cream, mayonnaise, garlic powder, Worcestershire, balsamic, and green onions. Season with salt and pepper to taste. Once onions have cooled a bit, give them a rough chop and then add them to the rest of the mixture. Cool in the fridge for 2-3 hours at least, but can cool for up to 24 hours. Serve with sea salt and vinegar chips, celery, or any other goodies you like. So I mentioned a few weeks ago that I was in Seattle for my friend Ams' wedding. I would have been happy just to be back in the beautiful Emerald City, but I was especially thrilled to be there celebrating the big day with one of my dearest college friends. The wedding was so awesome that I could probably just start a blog ONLY about the evening of April 26, but I'll try to keep it to a few awesome elements. Since I hadn't eaten anything since Logan Airport, I was also delighted to see all of the tasty snacks included in the bag. The wedding basics (Advil & water, much appreciated on both Saturday and Sunday mornings), Seattle Chocolates, Boston Baked Beans for Ams' hometown, tea, cookies, granola bars, chips, and a Sleepless in Seattle "Do Not Disturb" sign. Plus lots of Skittles ("beast mode"). Nicely done, newlyweds! Hope you had the most amazing honeymoon. Let's do the wedding again this weekend? 1. 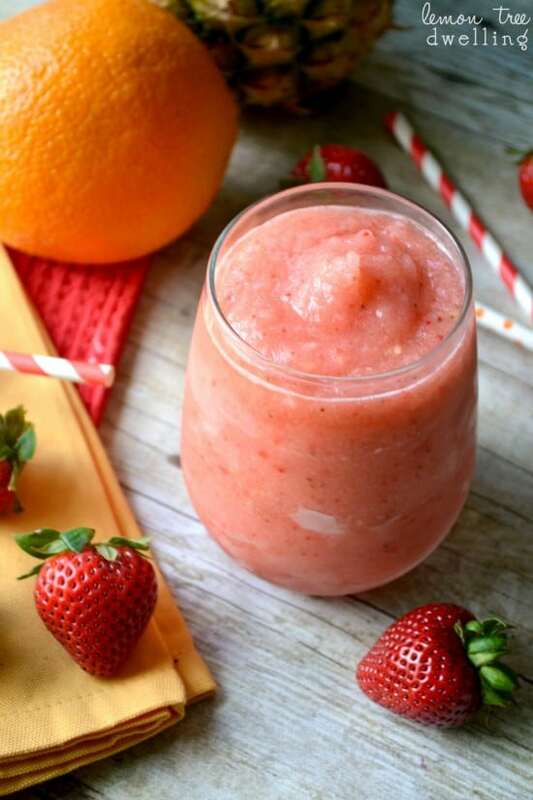 Frozen Sangria. UMMM HELLOOOO why didn't I think of this. 2. 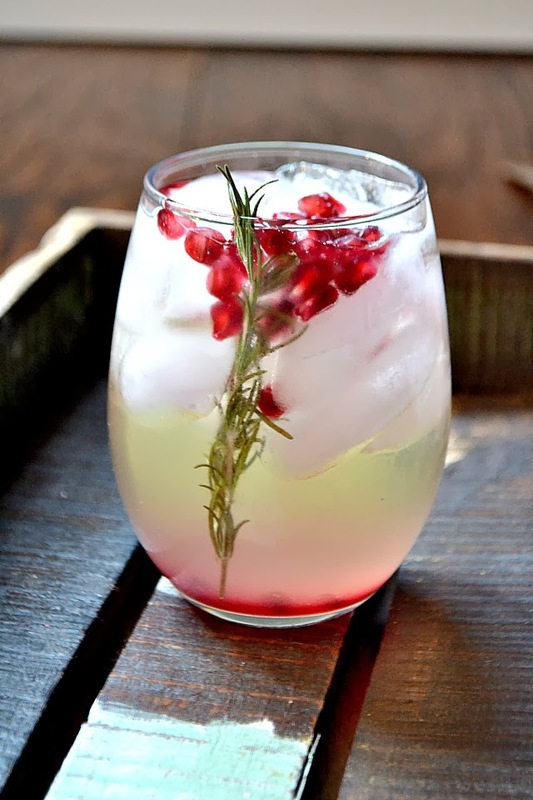 Although this recipe was intended for Christmas, I love the idea of mixing rosemary and pomegranate in the summer. 3. 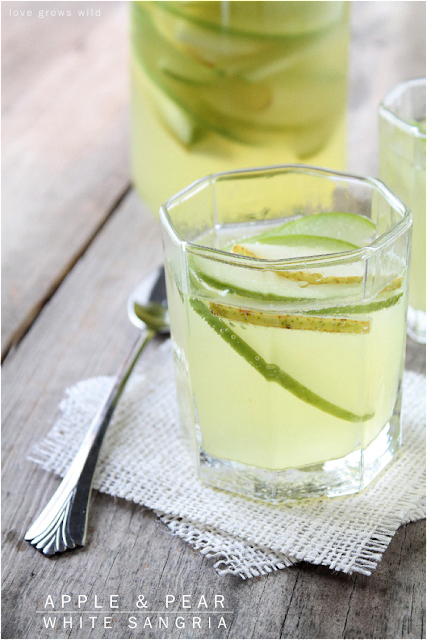 Ooooo apple and pear sangria. I bet this is delish. My mom would like this. 4. What up watermelon and basil sangria. LOVE THIS. Words can't describe how obsessed I am with fresh watermelon...'specially in my DRANK. 5. I'm a weirdo and like lavender and herbs and other things in my drinks. 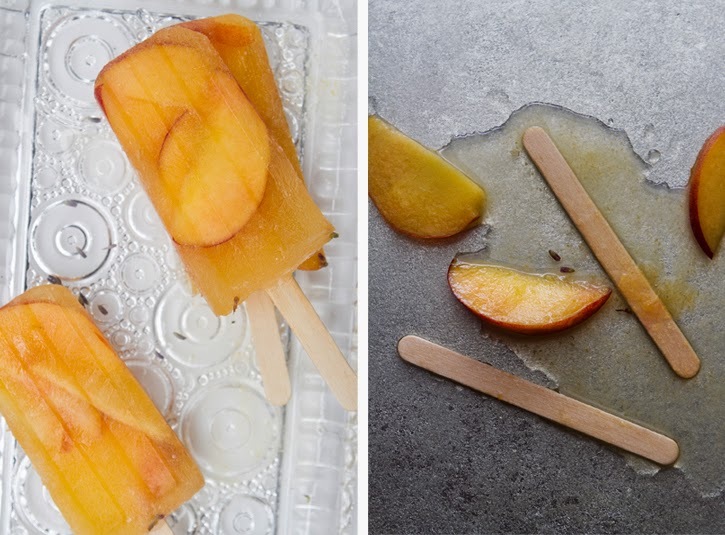 Check out these lavender and white peach sangria pops. Are you guys licking your screen yet? Oh? Just me? Cool.